To understand what’s happening in Syria right now, you have to understand the tactics and motivations of the US and NATO -- parties sharing interwoven aims and goals in the Middle East/North African (MENA) region. Where the propaganda claims that various bad dictators have to be taken out, or that democracy is the goal, neither have anything at all to do with what’s actually happening or has happened in the region. For starters, we all know that if oil fields were not at stake then the West would care much much less about MENA affairs. But a lot of outside interests do care. And their aims certainly and largely include controlling the region’s critical energy resources. There’s a lot of concern over whether Russia or China will instead come to dominate these last, best oil reserves on the planet. Further, we can dispense with the idea that the US and NATO have any interest at all in human rights in this story. If they did, then they’d at least have to admit that their strategies and tactics have unleashed immeasurable suffering, as well as created the conditions for lots more. But it would be silly to try and argue about or understand regional motivations through the lenses of human rights or civilian freedoms -- as neither applies here. 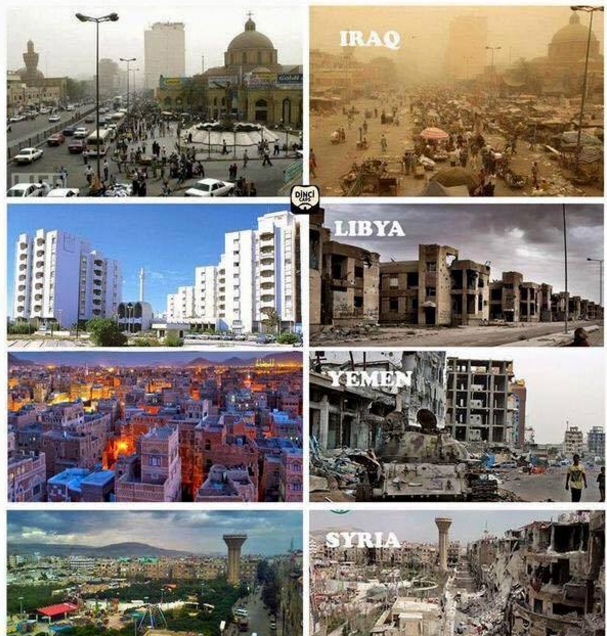 Instead, the policies in the MENA region are rooted in fracturing the region so that it will be easier to control. That’s a very old tactic; first utilized to a great extent by Britain starting back in the 1700s. Divide and conquer. There’s a reason that’s a well-worn catch phrase: it’s hundreds of years old. But to get a handle on the level of depravity involved, I think it useful to examine what happened in Libya in 2011 when NATO took out Muamar Gaddafi and left the country a broken shell -- as was intended. I cannot really give you a good reason for NATO involving itself in taking out Gaddafi. I only have bad ones. The official reason was that after the Arab Spring uprising in Libya in early 2011 (with plenty of evidence of Western influences in fanning those flames) things got ugly and protesters were shot. This allowed the UN to declare that it needed to protect civilians, and the ICC to charge Gaddafi with crimes against humanity, declaring that he needed to stand trial. On 27 June, the ICC issued arrest warrants for Gaddafi, his son Saif al-Islam, and his brother-in-law Abdullah Senussi, head of state security, for charges concerning crimes against humanity. Libyan officials rejected the ICC, claiming that it had "no legitimacy whatsoever" and highlighting that "all of its activities are directed at African leaders". That month, Amnesty International published their findings, in which they asserted that many of the accusations of mass human rights abuses made against Gaddafist forces lacked credible evidence, and were instead fabrications of the rebel forces which had been readily adopted by the western media. After the ICC's indictment, it was a hop, skip and a jump to declaring a NATO-enforced ‘no fly zone’ over Libya to protect civilians. From there it was just a straight jump to NATO actively shooting anything related to the Gaddafi government. NATO had thereby chosen sides and was directly supporting the rebellion. The pattern in play here is always the same: cherry-picked events are used as a pretext to support the side seeking to topple the existing government and thereby leave a sectarian wasteland to flourish in the inevitable power vacuum. If you are like most people in the West, you know almost nothing of any of this context. It’s not well reported. And Libya is rarely in the news even though it's going through increasingly desperate times. Gaddafi’s great crime seems to be giving away too much oil wealth to his people. Was he a strongman? Yes, but you have to be to rule in that region right now. Was he the worst strong man? No, not by a long shot. As bad as he was, at least he didn’t kill a million Iraqis on trumped up charges of non-existent weapons of mass destruction. Nor was he chopping off 50 heads per week and stoning females for adultery as is the case with Saudi Arabia right now. But again, whether he killed protestors or not, or committed war crimes or not, is irrelevant to the power structure. What mattered was that he had locked out Western interests, and instead used his country's oil wealth to provide free or extremely cheap health care, education and housing to a wide swath of Libyans. At around 08:30 local time on 20 October, Gaddafi, his army chief Abu-Bakr Yunis Jabr, his security chief Mansour Dhao, and a group of loyalists attempted to escape in a convoy of 75 vehicles. A Royal Air Force reconnaissance aircraft spotted the convoy moving at high speed, after NATO forces intercepted a satellite phone call made by Gaddafi. NATO aircraft then fired on 11 of the vehicles, destroying one. A U.S. Predator drone operated from a base near Las Vegas fired the first missiles at the convoy, hitting its target about 3 kilometres (2 mi) west of Sirte. Moments later, French Air Force Rafale fighter jets continued the bombing. The NATO bombing immobilized much of the convoy and killed dozens of loyalist fighters. Following the first strike, some 20 vehicles broke away from the main group and continued moving south. A second NATO airstrike damaged or destroyed 10 of these vehicles. According to the Financial Times, Free Libya units on the ground also struck the convoy. According to their statement, NATO was not aware at the time of the strike that Gaddafi was in the convoy. NATO stated that in accordance with Security Council Resolution 1973, it does not target individuals but only military assets that pose a threat. NATO later learned, "from open sources and Allied intelligence," that Gaddafi was in the convoy and that the strike likely contributed to his capture. Because you live in the real world, you know that NATO knew exactly where Gaddafi was at all times and that he was in that convoy attempting to escape NATO's bombing raid. Further, you won’t be surprised to learn that many of these vehicles were pickup trucks that really posed no military threat to NATO. The point was to kill Gaddafi, and numerous resources were brought to bear on that mission. Gaddafi’s killing was the assassination of a foreign leader by Western interests. In this case, Gaddafi was just yet another target in a long line of leaders that attempted to keep those same interests at bay. After NATO was finished making a mess of Libya by taking out Gaddafi and leaving a right proper mess of a power vacuum, it simply departed -- leaving the country to fend for itself. Libya descended, of course, into an outright civil war and has remained ever since a hotbed of sectarian violence and increasing ISIS control and presence. If NATO/US had to follow the Pier I rule of “you break it, you buy it” they would still be in Libya offering money and assistance as the country settles down and begins the long process of rebuilding. But no such luck. That’s absolutely not how they operate. It’s disaster capitalism in action. The idea is to break things apart and then make money off of the pieces. It's not to help people. Otherwise, how do we explain these images? While imperfect by many standards, all of these countries were stable and increasingly prosperous before outside interests came in and turned them into a living nightmare. It is this context that explains why such reactionary and violent groups as ISIS arose. They are the natural response of violated people seeking to assert some control over lives that otherwise have no hope and even less meaning. I’m not justifying ISIS; only explaining the context that led to its rise. After that atrocious summary, how bad does life under Gaddafi sound now? Again, he was targeted for execution by Western interests and the resulting mess is of little surprise to anybody with even modest curiosity about how violent overthrows tend to work out in the MENA region. But where is the UN security council denouncing the war crimes? And where is the ICC leveling crimes against humanity charges? Nowhere. There’s no more Western political interest in Libya now that it has been broken apart. As they say in the military: once is bad luck, twice is a coincidence, but three times is enemy action. This pattern of eliminating “a very bad man” and leaving the country in a complete mess has happened three times of late, with Syria targeted to be the fourth. So enemy action it is. ISIS and other extreme jihadist groups arose because of brutal conditions that made such harsh interpretations of ancient religious texts make sense by comparison. When you have nothing left to believe in, one’s belief system can compensate by becoming rather inflexible. I know I have greatly simplified a terribly complex dynamic, but -- speaking of beliefs -- I don’t believe that terrorists are born, I believe they are raised. When one has nothing left to lose, then anything becomes possible, including strapping on a suicide belt and flicking the switch. What I am saying is that this is not a battle between Christians and Muslims, nor is it a battle between good and evil, both characterizations that I’ve read recently in great abundance. That’s all nonsense for the masses. This is about resources and true wealth that is being siphoned from the people who have had the misfortune to be born on top of it, and towards other regions with greater power and reach. There’s nothing different in what I am reading today from what the British redcoats did in India from the late 1700’s throughout the 1800’s. Their military might assured that the East India Tea Company could continue to extract resources from the locals. At the time the locals were called heathens, implying they were subhuman and therefore could be safely dispatched. Now they are called terrorists -- same thing. Dehumanize your foe to help rationalize one’s behaviors. It’s a tried and true practice of war propaganda. While we might be tempted to sit in our Western environs, secure in the idea that at least we aren’t ‘over there’ where all the bad things are happening, it would be a mistake to think that this turmoil will not impact you. I’m not talking about the ultra-remote chance of being a victim of blow-back terrorism either. I am referring to the idea that it would be a mistake to think that any government(s) that think nothing of ruining entire MENA countries will hesitate to throw anybody else under the bus that gets in their way. Ben Bernanke gave no thought to throwing granny under the bus in order to help the big banks get even bigger. He willingly and knowing transferred over a trillion dollars away from savers and handed it to the big banks. Similarly, we shouldn't expect enlightened behavior to emerge from the shadows of leadership once things get even dicer on the world stage. In fact, we should expect the opposite. It would be a mistake to think that powers in charge would not turn their malign intent inwards toward their own populace if/when necessary. Today it’s Syria, yesterday it was Libya, but tomorrow it might be us. My intention in stringing these dots together is so that we can have an informed discussion about what’s happening in Syria and the Middle East at large. I am not at all interested in trying to understand events through the framing lenses of religion and/or ‘terrorism’, both of which are tools of distraction in my experience. Instead, I want to understand the power dynamics at play. And to try to peel back the layers, to understand why the powers that be consider this region so important at this moment in history. I think they know as well as we do that the shale oil revolution is not a revolution at all but a retirement party for an oil industry that has given us everything we hold economically dear but is on its last legs. I think that the power structures of the next twenty years are going to be utterly shaped by energy – who has it, who needs it and who’s controlling it. They know as well as anyone that their oil wealth will run out someday; and so, too, will the West’s interest in them. With no giant military to protect them, the royalty in Saudi Arabia should have some serious concerns about the future. Saudi Arabia became a net exporter of wheat in 1984 from producing almost none in the 1970s. The self-sufficiency program became a victim of its own success, however, as it quickly depleted aquifers that haven’t been filled since the last Ice Age. In an unexpected U-turn, the government said in 2008 it was phasing out the policy, reducing purchases of domestic wheat each year by 12.5 percent and bridging the gap progressively with imports. The last official local harvest occurred in May, although the United Nations Food and Agriculture Organization projects that a small crop of about metric 30,000 tons for traditional specialty bakery products will "prevail" in 2016. At its peak in 1992, Saudi Arabia produced 4.1 million tons of wheat and was one of the world’s top 10 wheat exporters. The Saudis did something very unwise – they pumped an aquifer filled over 10,000 years ago and used it to grow wheat in the desert. Now their wells are running dry and they have no more water. And yet their population is expanding rapidly even as their oil fields deplete. There’s a very bad intersection for Saudi Arabia, and the rulers know it. It helps to explain their recent actions of lashing out against long-standing regional foes and helps to explain the increasing desperation of their moves to help destabilize (and even bomb) their neighbors. My point here is that as resources become tight, the ruling powers can be expected to act in increasingly desperate ways. This is a tenet of the Long Emergency of which James Kunstler wrote. The only response that makes any sense to me, at the individual level, is to reduce your needs and increase your resilience. This is something we cover in great detail in our new book, Prosper! : How To Prepare for the Future and Create a World Worth Inheriting, so I won’t go into all the details here. Instead, my goal is to help cast a clarifying light on recent events and add some necessary detail that can help us more fully appreciate what’s happening around the world and why taking prudent preparations today is becoming increasingly urgent.